Plug-n-Show - Includes ribbons, controller, all tree hardware. 6'6" pixel tree with 400 pixels. Includes everything necessary to setup the tree. Pixels are mounted in strips ready to hang on tree ( Save and do it yourself ). Stake template provides perfect spacking for the 16 strings and the 3 support cables. Staked stub straps can remain frozen in the ground until spring allowing for easy takedown regardless of the temperature. Laydown spacing template and drive support cable and pixel string stakes through the 3 hole stap stubs. Place center pole and 3 support cables. Level pole by adjusting straps. Connect controller to center pole using releasable straps. Place top on tree with pixel strings attached. This is 6'6" you may need a ladder. You can save by doing some of the assembly yourself. The listed price includes: proper spacing and snapping the pixels into the pixel strips. The strips are then cut to length and doubling up at the ends for extra support. Using scraps from the pixel/strap assembly 19 stake strip stubs are cut and folded. In additon the strips are connected to the top ring. You can save $50 by doing these assembly steps yourself. Select the "Strip Assembly - Done by Customer" option below. 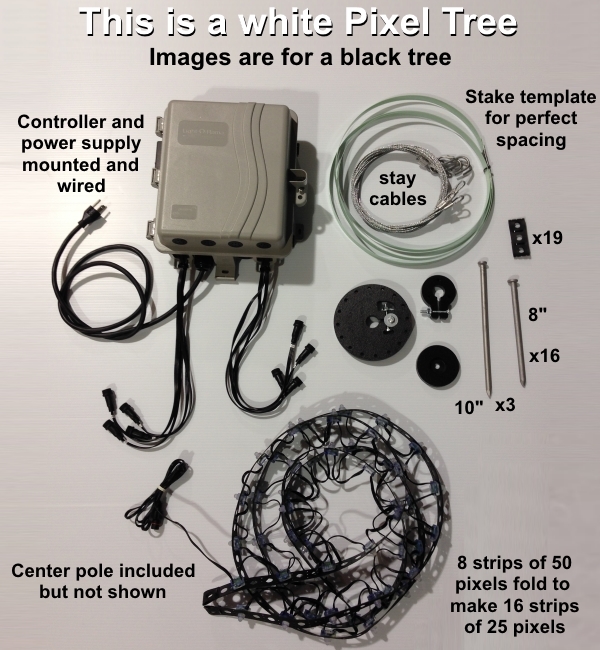 IMPORTANT: THIS PIXEL TREE USES WHITE PIXELS, WIRES AND STRIPS!